For the people that find that they owe more taxes to the Internal Revenue Service (IRS) for the 2014 tax year, paying that tax bill could be a problem. 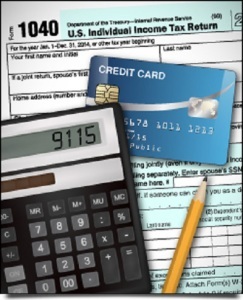 The amount of your tax bill is due by the last day to file income tax returns, April 15. If you have not prepared properly, the amount of the tax bill could create a significant financial hardship. To ensure that they can pay their tax bill on time, some people resort to using their credit cards to pay their taxes to the IRS. However, many of these people find that paying their taxes with a credit card can result in hefty fees that create a considerable amount of debt for the taxpayer. 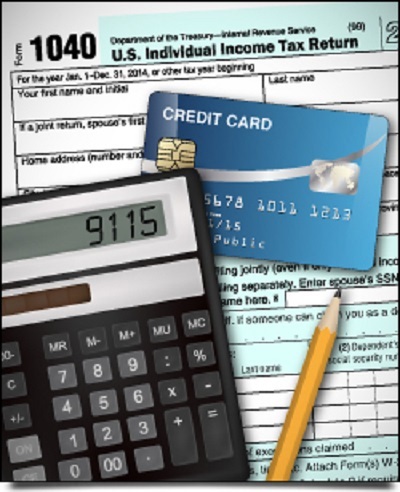 Here are some things that you should know about paying your tax bill with your credit card. The IRS does not accept credit card payments directly like they accept checks and bank account transfers because they are prohibited from paying the servicing fee that credit card companies charge merchants for authorizing transactions. This means that the taxpayer will have to go through a third-party payment processer to ensure that the payment made with their credit card is sent to the IRS in a form that they will accept. While handing your credit card information to a third party that has not properly been vetted is risky enough, it will also cost you more than making a payment to the IRS using other methods. The fees paid to third-party payment processers that handle credit card payments for the IRS can be significant depending on the method used. If you use a debit card that uses the Visa or MasterCard network for processing payments, you may be able to get away with a flat charge of between $2.50 and $3.50 for making the transaction. If you use a credit card issued by a credit card company, you are often charged a percentage of the transaction as the fee. These fees can be as high as 3 percent of the amount of the transaction. For a tax bill of $5,000, this fee can be as much as $150, a significant amount to pay just to pay a bill. If you are unable to pay off the amount charged for your tax bill before the end of the billing cycle, you will also be charged interest on the balance on your credit card. Carrying a balance on a credit card is one of the worst ways to spend your income because paying interest gives you no financial benefit other than allowing you to defer paying the entire amount for a period of time. With some credit card interest rates approaching 22 percent for purchases, the amount paid for the tax bill can quickly snowball into an enormous amount if you are only paying the minimum payment for your credit card. Over the course of a year, that $5,000 payment can generate another $1,100 in interest payments that must be paid to clear your balance. You have brought up a really fantastic point. It’s very useful and helpful. Thank you for sharing your article about this Paying Tax Bill With Credit Card Results In Hefty Fees. Great! Yeah good point. DON”T put your tax bill on your credit cards.